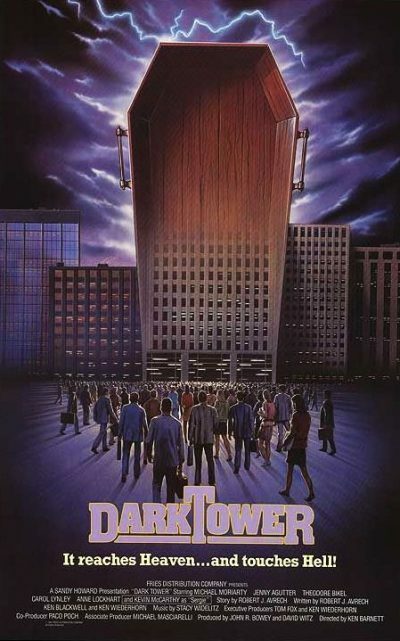 A credibly culty cast is woefully incapable of saving this “haunted skyscraper” nonsense. It probably didn’t help that original director Francis left the film, and had to be replaced by the woeful Wiederhorn under a pseudonym. The latter has given us two thoroughly underwhelming zombie films (Return of the Living Dead Part II, plus Shock Waves, which managed largely to waste Peter Cushing, as well as a great idea in Nazi zombies), and demonstrates no more talent here for ghost stories. It begins with a window-cleaner falling to his death from a Barcelona tower-block, after watching its architect Carolyn Page (Agutter), as she changes out of her construction clothes, following a tour given to the skyscraper’s financiers. Worse, the plummeting peeper landed on one of the financiers. Leading the investigation is Dennis Randall (Moriarty), and the body count starts to rise as more mysterious incidents occur. Randall eventually calls in psychic specialist Max Gold (Bikel), to no avail. Could it be anything to do with the mysterious disappearance of Page’s husband, who has been presumed drowned? Of course it is: you’ll have figured that out long before Randall does. Not that it matters, since the film largely consists of the characters roaming the corridors of the partially completed building on their own. Agutter looks increasingly sweaty and hysterical (above); Bikel delivers interminable monologues to the fittings; and Moriarty might as well be checking his watch to see if the hotel bar is open yet. Oh, and Wiederhorn seems to have a thing for camera shots from the bottom of elevator shafts, which speckle the running time. The elevators play no significant part in the film past 20 minutes, when a security guard is offed in one. Well, I presume he gets offed, anyway: all you get is a scream and cut-away to a splatter of blood from off-camera. What exactly happened is, as with many things here, vague and undefined. For example, why does Randall decide to call in a psychic? [Maybe they were the result of his own paranormal talents, another thread here which the script dead-ends] And what is an obviously American cop – sorry, “security consultant” – doing in Barcelona anyway? Not that the film has any local atmosphere anyway: few scenes are shot outside the building, and it might as well be Manhattan or Los Angeles. You wonder why they bothered. More than one other review has compared this, negatively, to Francis’s previous work on anthology movies like Tales From the Crypt, and I can see why – as a 20-minute segment, it might have worked. At feature length, it’s stretched painfully thin. I am entirely unsurprised it sat on the shelf for two years, then went straight to video. There’s a mildly pleasing EC Comics vibe about the eventual comeuppance suffered by the wrongdoer, and Stacy Widelitz’s electronic score is occasionally interesting. Otherwise, this is a monumental waste of everyone’s talents – not that there’s much present in Wiederhorn’s case – and equally as much a waste of the viewer’s time.